Posted March 26, 2014 by Dr. Jason Hare & filed under Massage. 1. Massage releases toxins. 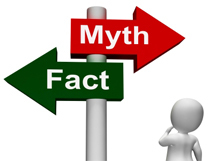 This crazy claim is one of the most common myths. To start with, what toxins are we talking about? Are these toxins that we put into our bodies; such as preservatives, aspartame, pesticides, or cigarette smoke? Let me tell you now that massage does not remove these things from the body. If you don’t want those things in the body, DON’T PUT THEM IN YOUR BODY. Or, are these vague “toxins” the by-products of metabolism, such as lactic acid or free radicals? These things are easily tested for through a simple blood test, and do you know what? There is no difference in blood toxin levels before and after a massage. There is no scientific validity to the claim that massage releases toxins. As an extension of this myth, patients are often told that they must drink water after a massage to get rid of those toxins. Although drinking water is a healthy habit, there is no reason why you should drink it immediately after you massage. 2. It has to hurt if it’s therapeutic. There’s a common belief that for a massage to be really good it has to hurt. We commonly hear, “Go ahead, press as hard as you can. I can take it.” Although your treatment can be painful when you have strong muscle spam, if you’re just dealing with tight, inflexible muscle your massage does not have to be a sufferfest. Always give your registered massage therapist feedback during the treatment. He or she should be able to change the pressure to suit your comfort levels. If anything, if the pressure is too deep the muscle will actually contract even more than it was to protect itself. No pain, no gain is a foolish idea! 3. It’s only for tight muscles. Yes, it is very good for tight muscles, but don’t sell massage short. Research as shown many other benefits to massage: lowered blood pressure, decrease anxiety and depression, reduced sports injury risk, improved flexibility, improved sleep, improved strength and even improved immune system function. You see, massage treats more than muscular condition, it treats the human condition. This is why many people choose to keep a regular check up as part of their health maintenance. Remember, if you are looking for a Nanaimo Massage Therapist as part of your health care team, look no further than Pure Chiropractic, 250-585-8866.